On Saturday I reported And he scores! Amazon scrubs "sock puppet" five-star book review by prominent Yale professor, author, columnist about how I successfully tagged prominent Yale professor, author, and Huffington Post columnist David L. Katz MD for posting a shill review for a novel he wrote under a pseudonym. In February 2014, David Katz MPH ’93, the director of the Yale School of Medicine’s Prevention Research Center, wrote two glowing online reviews of a science-fiction novel called reVision. In his biweekly column in The Huffington Post, Katz lauded the book’s “lyrically beautiful writing,” comparing it to the work of a veritable “who’s who” of great writers, including Plato, John Milton and Charles Dickens. “I finished with a sense of illumination from a great source,” he concluded. “The most opportune comparison may be to a fine wine.” Katz had used similar language two days earlier in a five-star product review he posted on the book’s page on Amazon. 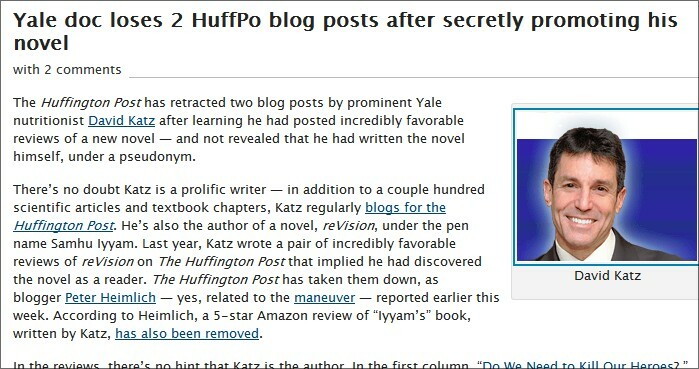 If you want to read Dr. Katz's January 17, 2014 and February 18, 2014 Huffington Post columns hyping the novel, as of today you'll have to do so via The Wayback Machine -- that's where the links will take you. This is the second time the Huffington Post has pulled a story after my inquiries to editors. Details via my July 16, 2013 Sidebar item, Huffington Post scrubs Boston-area "comedy" duo's YouTube containing anti-Jewish slur. This item has been slightly updated.